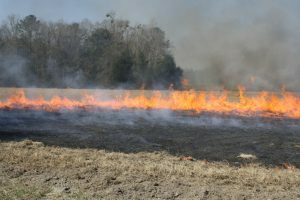 UGA Forage Extension Team | Should I burn my hayfield? Every year county agents get questions from producers concerning if they should burn their Bermuda grass hayfields. There are several benefits to burning your hayfield. Burning can help producers manage thatch in their stands. If the thatch layer becomes too thick over time then this can create several issues. For example, this past year in my area, leaf spot diseases were severe in numerous hayfields. Thatch can tie up nutrients, and be a “spore reservoir” for leaf spot diseases. Thick thatch layers can also hinder or delay green up, reduce water infiltration into the soil, and make establishment of winter annuals a challenge. Other benefits of burning include maybe a cleaner first cutting of hay and managing spittlebugs. If you would like more information on leaf diseases it can be obtained below. The optimal time of year to burn is just before spring greenup. If you decide to burn too early then you might have to deal with an early flush of weeds. If you burn too late after greenup has started then early season growth can be suppressed resulting in loss of yield. Producers need to prepare for burning ahead of time. In the fall, 4 to 6 inches of growth needs to remain to supply enough fuel for a good fire. Producers need to know that varieties such as Tifton 85, Tifton 78 and Coastcross can be damaged by burning due to being more stoloniferous. These varieties do not produce an extensive root system. These bermudagrass varieties should be burned with a head fire rather than a backfire. A backfire is a fire that burns into or against the wind which burns slower and produces a hotter fire. If a backfire has to be used on the stoloniferous varieties then consider initiating the burning operation early in the morning or right after a rain. These measures could result in a cooler fire and be less injurious. Bermuda grass varieties such as Alicia, Coastal and Russell seem to tolerate burning better or more rhizomatous than the ones previously mentioned. needed. Find out if other restrictions apply such as time of day or other regulations that need to be obeyed. Please take no chances with dealing with fires and have a plan. A person in charge or fire boss needs to be appointed. Producers need to establish fire lanes to manage the burn. Fire lines need to be at least 6 feet wide around the field that is going to be burned. Consider plowing a 10 to 12 foot fire lane if you are dealing with fields in the 5 to 10 acre range of larger. A fire lane can be made wider by using a backfire. Producers need to watch the local weather before implementing a prescribed burn. Please pay attention to wind direction, speed and moisture to ensure that fire does not jump the fire breaks. According to several sources, do not burn if wind speed exceeds 10 to 12 mph. Wind direction is a factor in planning a burn, please avoid burning during times if the wind will potentially blow smoke in the direction of houses or roads. Burning is a cheap, and effective means of removing thatch, managing foliar diseases and weeds in bermduagrass production. If this is utilized please have a plan so it can be used effective way. A great resource to study for planning a bermudagrass burn is http://www.aces.edu/pubs/docs/A/ANR-0989/index2.tmpl Use of Fire in Bermudagrass Managment by Dr. Don Ball. If you have any questions about this subject please contact your local county Extension agent. Posted in Grazing, Hay, weeds. This entry was tagged burning, hayfield. Bookmark the permalink.